Today Talgo and Deutsche Bahn have released the first details about DB’s new generation of passenger trains for intercity and eurocity services. This makes Talgo the winner of the 2017 tender for new passenger train compositions (locomotives + coaches). DB sources state that the new trains are ordered for lines with ‘special requirements’ and will offer ‘ICE comfort’. Berlin – Amsterdam requires multi system trains for both 1.5kV DC with 15kV 16 2/3Hz catenary systems. The plan is to introduce the new rolling stock connecting the two capitals in December 2023. Journey time will be reduced by at least 15 (no changing locomotives at Bad Bentheim anymore). Both Westerland and Oberstdorf are end stations along non-electrified lines. It will be interesting to see which solution will be chosen to bridge these catenary gaps. 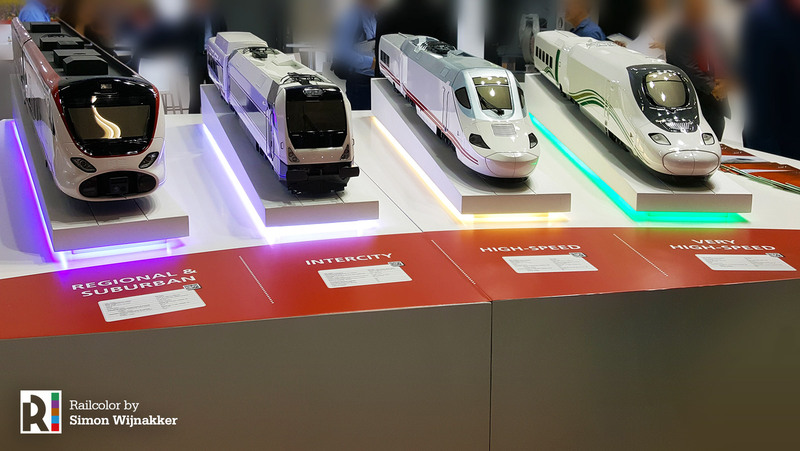 Various Talgo products on display during InnoTrans 2018 in Berlin – Talgo VitTal for regional/urban services, loco-hauled stock for intercity, Talgo 250 for Renfe and Talgo 350 for Haramain high speed services. New locomotives for Amsterdam – Berlin before 2023? Meanwhile, the Amsterdam – Berlin connection is topic of several discussions. Ridership numbers are going up, but the Dutch railways (NS) would like to speed up the Eurocity connection as soon as possible. To set an example, it ran a faster train during InnoTrans 2018 by skipping most stations in the Netherlands. Another solution is using newer interoperable locomotives – NS has announced a tender for twelve Vectron locomotives, of which the first should be available in 2020. However, it is not known (yet) what the outcome is of this procedure.